Posted December 1st, 2017 by Jeremy Dalton. Imagine how great it would be if you could just press a button from your car and enter into a well-lit home. While you walk inside, lights would ramp up slowly, giving you the time to adjust your eyes. Well, this can be a reality now with the practical and environmental-friendly home automation system. Right from music to security and temperature, your ‘smarthome’ system will be able to control everything, thereby saving your energy costs and enhancing your safety further. This is basically integrating all your electronic systems into one main control, giving you easier access to a smarter and faster life. We, at Service South, offer brilliant home automation systems in and around Atlanta, Brookhaven GA, Buckhead, Griffin GA, Marietta, and Newnan GA. Here are the following ways it can prove to be beneficial for you. Take a look. You can set the temperature of your home according to your family schedule with such a system, thereby enabling you to cut down on your energy bills. You can also make adjustments from your mobile device when you are not at home. You will be able to monitor your camera and alarm system no matter where you are. So, you can now keep an eye on the activities of your home despite being away. Get welcomed into your house by your favorite tv shows, news programs, sportscast, or music with a programmed automation system. You can control what your children will be watching if you cannot be there physically. You can easily create a regular plan to light up your home according to your schedule with this kind of a modern and efficient system. You can also add to the security of your homes by simply programming a schedule to light certain parts of your when you are away on a vacation so that the intruders get an idea that you are at home. So, without any further delay, bring home the multifaceted and useful home automation systems. Call us at 770-744-5373 now for the best product and service at the best prices. 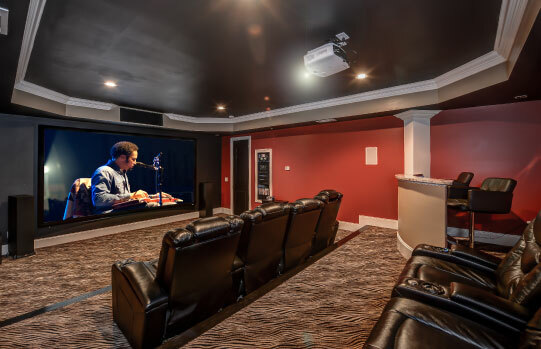 Home Automation and Low Voltage services in Atlanta, Buckhead, Marietta, and Brookhaven GA. Offering Home Theater Installation with Home Theater Seating in Griffin & Newnan.